Fans of 'ZOMBEAVERS' rejoice as nature becomes zombiefied once again. This film revolves around two sisters who decide that it would be nice to go visit a tourist trap for the weekend and boy is this place cheesy. Full of badly done Americanisms and staff that couldn't care as long as they get a pay packet its just the sort of place you would want to take your kids. But saying all of that, it is this that adds to the endearing charm of the place within the film. Their isnt much of a build up towards our Bigfoots (who are really just the employees dressed in costume for the place) falling into a toxic pond turning them into zombies, but this is what keeps the filming from falling flat as our sisters are trapped to fight for their lives against these Bigfoot creatures (Bigbies?). 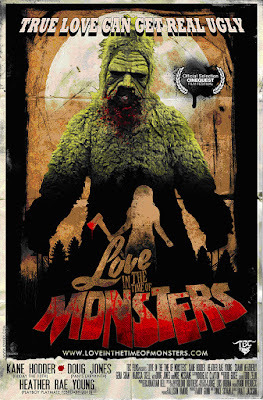 Throw in witty remarks, the undead nature of the woods and even Bigfoot and you get this all out vactaion of a lifetime. Reasonably paced throughout though it does feel slow in the middle of the movie but this is mainly used as character development time. The special effects are practical with only a small bit of cgi, but even with that they hold up really well and brings images of horror movies from the 1980's to mind. 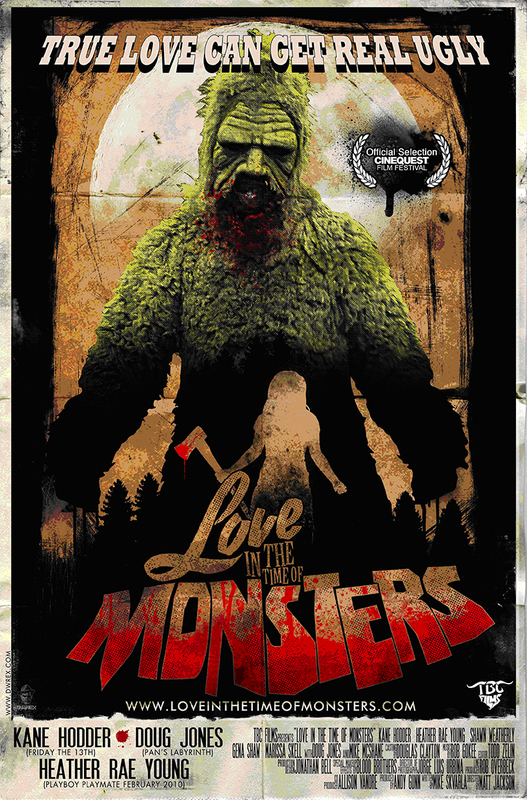 'LOVE IN THE TIME OF MONSTERS' has a whole host of appearances by people like Kane Hodder (the definitive Jason Voorhees) and Doug Jones (Abe Sapien - Hellboy), and what makes a refreshing change is to see Hodder doing a bit of comedy!